Hi everyone! Arrived in sunny Melbourne - landed in 31 degrees phew it's hot!!!! We spent our first day being tourists and did a bike tour around Melbourne city centre - this is a great way to get around as you can fit a lot more in. We saw Federation Square where they were holding Live Music week and we saw lots of bands playing - the Killer Bees were particularly good! We also saw the Library, visited the art gallery which Kate D loved and Bennett and Round - not so much ;). Went to the top of the Rialto observation deck - the lift wisks you up so quickly your ears pop! 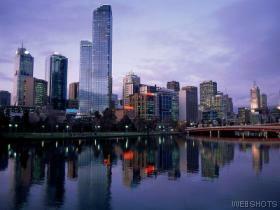 Lovely views of Melbourne and we met a nice Ozzi couple who gave us free chips BONUS! :) We then went down to the Victoria docklands which are quite wacky - art work of cows literally in trees (take a look at the photo), and a mosaic of all the ozzi stars including Rolf Harris plus along the one stretch there are lots of really glitzy bars even the fish and chip shop is posh! So it's no surprise that we saw two wedding parties that afternoon! We were so completely drained from all our antics in NZ and the days activities that we fell asleep about 8 pm - the good intentions of going to see the jazz bar Bennetts lane never happened! Next day we headed to St Kilda on the tram - St Kilda is known as the hip and trendy beach side suburb of Melbourne for backpackers and it really does live up to its reputation! We spent the day walking past the Luna amusement arcade with its famous clown face entrance and then onto the beach and it would have been rude not to sip a few drinks from the beachside bars along the way - one bar even had strange looking wicker pods hanging from the rafters which you could sit in - very comfy! That evening was spent exploring one of St Kilda's busiest streets where we found a bar where when we entered we were offered (and accepted) the offer of a massage! We love Melbourne bars! :) After that we went back to the hostel where we had a few drinks with some irish lads that Bennett was sharing a room with - watched them play pool hoping to pick up some tips so we can beat chris and stu's arses when we see them next ha ha! Next day we picked up our camper van who we have decided to call MOOSE in the honour of New Zealand. Before we had even got round the first corner we broke the kettle woops lol! Moose got us safely back to St Kilda where we met with Andy one of the guys from the kiwi experience bus and headed off to our NEIGHBOURS TOUR WOOOOOOOOOOOOOOO! We went to the high school - erinsborough high, then onto Grundy studios where we saw Grease Monkey's, Lou's garage, Sky's green car and the bus stop that all characters leaving the show leave from. We then got to meet our FIRTS NEIGHBOURS STAR - JANELLE WOOP WOOP! Then the bit we had all been waiting for - RAMSAY STREET!!!!!!!!!! Ramsay street is a quiet and small cul-de-sac in a normal residential area where all the ral residents are very posh as they have their very own 24 hr body guard to make sure ppl like D dont try and steal papers from letter boxes or street signs! This was put in place after two ppl were caught doing naughty things on Harolds front lawn ha ha ha! We then went back to St Kilda for food at Greasy joes where we met some really drunk Ozzies who kept applying sun cream to bennetts arm - the waitress told us the guy was her first customer of the day - he was pure entertainment! We carried on our neighbours day by toddling off to the neighbours night at the Elephant and Wheelbarrow. We met HAROLD BOYD AND JANAE! It was such a fun fun fun cheeesssyyy night but lost the quiz miserably - however there were nt that many actual questions about neighbours but the ones we did have it was quite amusing to find that Andy knew the answer to all of them! The night endded in drinking and dancing! Next day was our glorious day of shopping! Melbourne is renowned for being the best place for shopping in the whole of OZ so we thought it rude not to! Then that evening after being pikeys and sneaking into the YHA for free showers we set off for the start of our Great Ocean Rd adventure. We went through Geelong and ended up parking up for the night in Torquay the Surf Capital of the south - very pretty! Next day we were rudely awakened by a monster truck with an nover active waterhose! Will not be leaving the windows open again - Round got very wet - think the digger man wanted us to move !